Whey has been neglected for far too long in Britain. Most cheesemakers either just give it away as pig feed (as we did with ours for years) or worse, pour it down the drain. So respect has to be paid to our thrifty Italian brothers for inspiring us to look again at this humble ingredient and to turn it into a fantastic, versatile cheese in its own right. We started making our Somerset Ricotta in early 2011 and it's gone from strength to strength ever since. Although inspired by the famous Italian cheese, we worked hard to develop our own unique recipe and create a high quality British Ricotta with a taste and texture all of its own. To make it, we heat the leftover whey from our Cheddar and then acidulate it to help coagulate the remaining proteins. 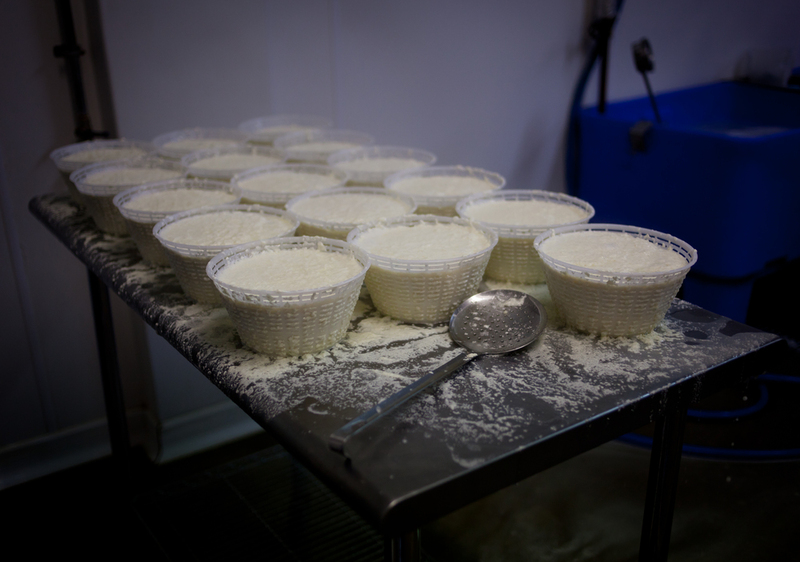 When ready, each cheese is individually hand-ladled into basket moulds which are then left to settle and drain before being packed. This helps to keep the texture as light and delicate as possible. Our Somerset Ricotta is light and fresh tasting, with a rich, slightly grainy texture and a pleasantly salty, full dairy flavour. Ricotta can bend to almost any culinary use, from starters to desserts. If you've never had it, try some simply spread on toast with a little jam or olive oil, or drizzle it with honey as a quick dessert. It's also perfect for cakes, pastries and puddings (try it in a cheesecake instead of cream cheese), and makes a lovely addition to savoury pasta or pastry dishes.